Through history cultures have believed that humans have an unseen energy system that plays a vital role in their physical, mental, emotional and spiritual health. Science has now validated that belief, proving that not only do we have an energy system, but that our energies interact with the energy of others. Attempts to harness, control, and direct this energy for the purpose of healing ones-self and others have developed through history. The belief that one can focus their energy (or the energy of God, universe, etc.) to help you and your energy is the root of these practices. 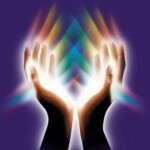 They have a variety of names; Reiki, Quantum Touch, Healing Touch, Laying of Hands, Intercessory Prayer are but a few. This exchange of energy occurs through physically touching, or being in physical proximity to the person, or by directing your intention to positively affect someone over long distances – depending on the method used.